Recently I went to see Views, the Boyd & Evans exhibition at the Ikon Gallery in Birmingham. This exhibition is, according to the gallery’s programme, ‘the first major survey of work by British artists Fionnuala Boyd and Les Evans, comprising painting and photography drawn from their 40 year career’, and is part of the London 2012 Festival. Including mostly photography and acrylics, the exhibition offers a range of somewhat disturbing and thought-provoking narrative pictures, deploying what the exhibition notes call ‘a subtle surrealism’ which ‘combines the epic with the banal’. Images such as Incident 1 and Incident 2, unremarkable titles covering the possible secrets of the painting, show figures in front of skyscrapers, in conversation, or perhaps argument. The ‘narrative’ of these paintings is hidden, but it must be there, and like the other exhibits here, make you want to make up your own stories. 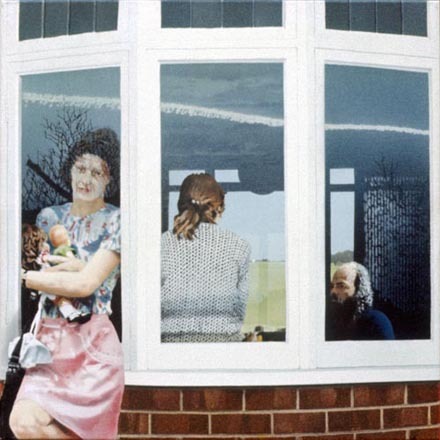 As I looked round the exhibition I concluded that these paintings looked, to me, as though they represent a kind of surreal suburban Gothic, in which the familiar and homely becomes somehow slightly twisted, sinister and even threatening. 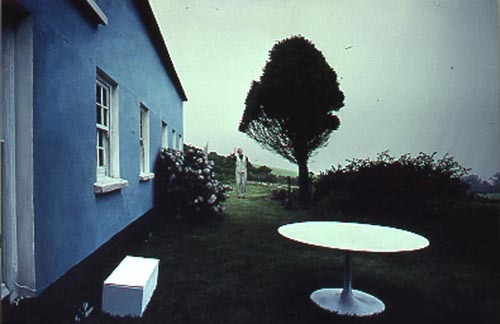 Master of Activities (1990) seems like a very familiar scene, with a man outside a blue-painted house, in a garden featuring plants and a white table. Despite its homeliness, this scene is somehow menacing – a trick of the light, perhaps, but it is as though something dark is lurking, or something terrible is about to happen. The menacing is combined with the inexplicable in Flight (1972), in which two figures lie on the grass surrounded by birds in flight; while in Outside In, Inside Out and Back to Back (1975), a couple inside a house appear menaced by the figure of a woman outside the window. In the first painting, she is holding a child, or perhaps a doll. Boyd and Evans say that ‘we are interested in our paintings being about something, representing a moment, and what might happen next’, and add that ‘we put elements in a picture and you have to find the story’ – and that is it, exactly; I spent all my time in the exhibition trying to find the stories. High Time (1980) is like the end of a film (and the couple are heavily influenced by cinema); two figures in stetsons walk in opposite directions. It should be a calm ending, but as one walks towards buildings and the other towards the open road, I felt as though I’d been left hanging, waiting for what happens next. Garden City (1971) is quite different, though: mysterious, Gothic, a corridor morphs into a forest, and two figures, atmospherically shrouded, step through into the trees, like the beginning of a fairytale. I must add that the lift is one of the joys of the Ikon – it contains a work of art itself. Work #409, for lift and choir bass, tenor, alto and soprano voices, 2005, by Martin Creed, performed by Ex Cathedra. The voices offer a sliding scale, rising or falling depending on whether you’re going up or down. It certainly adds a new dimension to travelling in a lift, and is so much more appealing that the mechanised ‘Lift Going Up’ that one normally hears.